Music at GMC: 2017 Sound the Trumpets! Ian Tracey returned to GMC for his 13th visit, having entertained us before with his inimitable brand of consummate musicianship & amusing anecdotes. 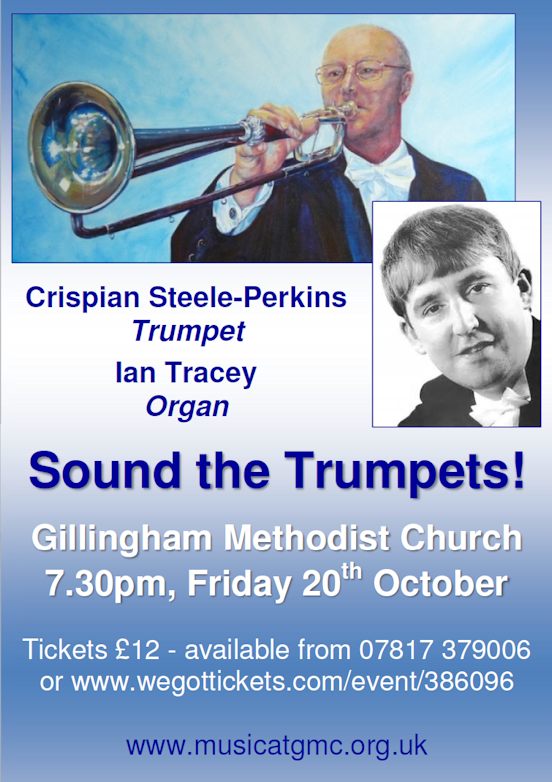 This year we also invited the distinguished trumpeter, Crispian Steele-Perkins, to join Ian. Together with GMC's famous trumpet stop they produced an amazing sound! PROFESSOR IAN TRACEY has had a life-long association with Liverpool Cathedral and its music, and with his two illustrious predecessors, continues the tradition of an almost apostolic succession. He studied organ with Lewis Rust, then with his immediate precursor Noel Rawsthorne. Studies at Trinity College, London, culminated in Fellowship, after which, scholarship grants enabled him to continue his studies in Paris, with both Andre Isoir and Jean Langlais. In 1980 he became the youngest Cathedral Organist in the Country, and after 27 years service in 2007, the Dean & Chapter created the post of 'Organist Titulaire', allowing him the freedom to devote more time to playing, lecturing, recording and writing. Since his appointment in 1980, he has played most of the major venues in this country, and an increasing number in Europe. Very much in demand in the U.S.A., he has made twenty-three extensive tours, playing in all the major Cities and in 1999 & 2003 undertook major tours of Southern Australia, recitaling, examining and teaching. The past two seasons have included concerts in New York, Seattle, San Francisco, Bermuda, Paris, Germany and Spain. On the wider musical canvas, he is a frequent broadcaster with the B.B.C. and a regular soloist at the Proms. His recordings on the Cathedral Organ have met with wide acclaim from the critics, recording for E.M.I., CHANDOS and PRIORY. He regularly examines and adjudicates and, over the past 24 years, has conducted 200 concerts with the Royal Liverpool Philharmonic Orchestra and Chorus. He holds Fellowships from twenty prestigious musical institutions both here and abroad, including the Royal College of Organists, as one of only 28 Honorary Fellows worldwide. In 2006, the University of Liverpool conferred upon him the degree of Doctor of Music, both in recognition of his long and distinguished service to music in Liverpool and of his national and international reputation. In 2008, the Royal School of Church Music and in 2009, the Guild of Church Musicians, awarded him Fellowships for distinguished services to church music and international reputation as a church musician. His other posts include: Organist to the City of Liverpool; at St. George's Hall; Chorus Master to the Royal Liverpool Philharmonic Society; Guest Director of Music for the BBC Daily Service, Professor, Fellow and Organist at Liverpool, John Moores University and past president of the Incorporated Association of Organists of Great Britain. CRISPIAN STEELE-PERKINS began playing the trumpet at the age of 10 and, after training at the Guildhall School of Music in London, he became a member of the English National Opera, the Royal Philharmonic Orchestra and the English Chamber Orchestra. As a soloist Crispian's purity of tone and artistic subtlety have received widespread critical acclaim for more than four decades. On 10th October 2015 the BBC's CD Review concluded that, of all the available recordings of Haydn's famous Trumpet Concerto worldwide, his is 'the one to have'. Crispian collects and restores antique trumpets upon which he has performed and recorded with The Academy of Ancient Music, The Kings Consort and The English Baroque Soloists. Appropriately, he plays the theme tune to one of the BBC's longest-running and most popular TV programmes, the Antiques Roadshow. Described by Virtuoso magazine as 'the world's leading exponent of the Baroque Trumpet', particularly when heard in duet with some of the world's greatest singers such as Kiri te Kanawa, Emma Kirkby, John Tomlinson and Bryn Terfel, he has also recorded with popular artists including Led Zeppelin, Kate Bush, Lulu, Cliff Richard, Bob Geldof and Harry Secombe. In addition, he has performed on numerous TV scores for shows including, amongst many others, Dr Who, Oliver Twist, The World at War, Inspector Morse and Tales of the Unexpected. In the world of cinema he has participated in more than 80 classic scores such as Jaws, Gandhi, Star Wars Episode IV, Batman, Monty Python's Life of Brian, Lord of the Rings - The Two Towers and no less than six films from the James Bond series. Whilst his numerous solo recordings extend from Handel to Glenn Miller, he has featured regularly as a concert soloist in London at the Royal Albert Hall and the Royal Festival Hall, New York's Carnegie Hall, Boston's Symphony Hall, the Sydney Opera House and Tokyo's Suntory Hall. His largest 'live' audience was 133,000 at the Edinburgh International Festival.